This story was updated at 8:58 a.m. ET. A rocket carrying NASA's newest climate satellite failed to reach orbit today (March 4) and likely crashed into the southern Pacific Ocean after its nose cone failed to separate on time, space agency officials said. 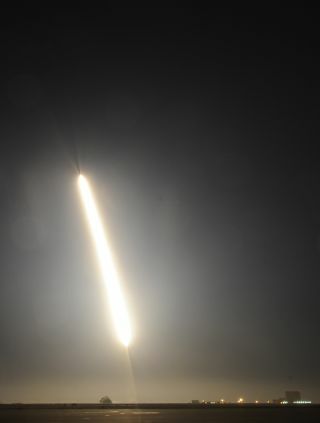 The rocket, a four-stage Taurus XL booster, launched from a seaside pad at California's Vandenberg Air Force Base at 2:09 a.m. PST (1009 GMT) carrying NASA's $424 million Glory satellite to study Earth's climate. Minutes after liftoff, the Taurus XL rocket's nose cone – a clamshell-like covering around the satellite called a fairing that is designed to separate during the trip into orbit – suffered some sort of failure, NASA officials said. A similar launch failure occurred on a Taurus rocket in 2009, dooming another NASA climate mission – the Orbiting Carbon Observatory – when it also crashed into the southern Pacific Ocean. The rocket is built by the Virginia-based company Orbital Sciences Corp., and officials there thought they'd solved the booster's problem. The Taurus XL rocket is a four-stage solid fueled booster that stands about 93 feet (27 meters) tall and is capable of launching satellites weighing up to 3,500 pounds (1,590 kg) into low Earth orbit. The rocket is a land-based version of Orbital Sciences' Pegasus booster, which is launched from an aircraft. The Glory satellite was designed to study the interaction between the sun's energy and Earth's atmosphere, with a specific focus on tiny particles – called aerosols – and their role in the planet's climate. Scientists hoped the satellite would address key uncertainties in climate research — especially those surrounding the contributions of manmade and natural aerosols to global climate change. "It would have made important measurements to the understanding of Earth as a system and the impacts of climate change," said Mike Luther, deputy associate administrator for programs in NASA's science division. Officials said it's too early to know if the malfunction that doomed the Glory mission is the same one seen in the 2009 launch. Orbital Sciences traced the previous launch failure to the system that initiates the rocket's payload fairing separation system. Because its fairing did not separate, the Taurus XL rocket was too heavy to carry the 1,160-pounds (525-kilogram) Glory satellite all the way to its intended orbit 438 miles (705 kilometers) above Earth. It did not reach the velocity required to reach orbit, and instead plunged into the Pacific, NASA officials said. NASA's Orbiting Carbon Observatory met a similar fate when its Taurus XL rocket failed two years ago. Orbital Sciences officials said they were stunned by today's failed launch attempt. After the 2009 failure, the company completely replaced the fairing separation system on its Taurus XL rockets with another proven. "We really felt that we had nailed the fairing issue," Grabe said. NASA declared a contingency situation soon after the failed launch to try and understand what went wrong. "We are taking all of the data that we have from our tracking sites to be able to give whatever information that we can ascertain from the vehicle data that might give us some clues as to what may have happened and why the fairing did not come off," NASA commentator George Diller said. Luther said NASA officials carefully weighed the risk of the attempted Glory launch and felt the Taurus XL rocket was ready to fly after some repairs to fix a computer glitch that thwarted a Feb. 23 launch try. "Clearly we missed something," Luther said. "We've now got to go off, find out what that is, fix it. And that is what we will do." It is also too early to tell if NASA will order a replacement satellite for Glory. NASA did order a replacement for the Orbiting Carbon Observatory, which is slated to launch in a few years, but Luther said the space agency will have to wait until the results from the Glory failure investigation to make a final decision on whether the carbon-tracking mission will launch on a Taurus XL as planned. "We'll have to weigh the outcome of this investigation and adjust our plans, accordingly," Luther said. NASA promised to perform a full investigation to determine exactly what caused today's launch failure. You can follow SPACE.com Managing Editor Tariq Malik on Twitter @tariqjmalik. Staff Writer Denise Chow (@denisechow) contributed to this report from Houston.